Carl Nash pitches against Douglas Wednesday Night. STURGIS, S.D. - The Sturgis Scoopers opened up their 2019 baseball campaign with a 9-2 win over Douglas Wednesday night. The Scoopers used a 3 run second inning to take the lead, and would put the game out of reach in the fifth, scoring 4 runs to make it 9-1. Douglas would add a run off an a throwing error in the sixth. 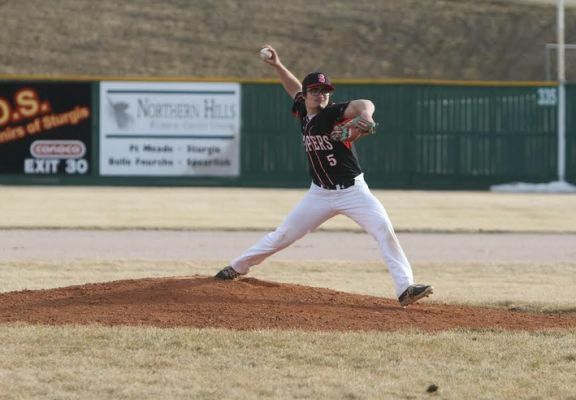 Starting pitcher Carl Nash got the win for Sturgis, pitching 3 innings and striking out six. Tristen Walter would get the save for the Scoopers. Offensively for Sturgis, Colton Cruickshank and Dylan Gillespie each had 2 R.B.I. 's, Alec Keffeler went 2 for 4 with 2 runs scored and Tristan Walter added an R.B.I. and a run. The Scoopers finished with 11 hits. For Douglas, Colton Tipton takes the pitching loss, striking out four in 3 and two-thirds innings pitched. Sturgis is 1-0 on the season and Douglas falls to 0-2.